I took a briefing with Smartsheet yesterday. It’s a type of collaboration software but it operates in a more textual way than the social media based tools on the market like Facebook or its business counterpart, Chatter from Salesforce.com. What’s immediately striking about the product is its spreadsheet metaphor. Everyone connected with the product will happily tell you that Smartsheet is not a replacement for Excel or Lotus but in one way it does make a bid to replace these spreadsheet stalwarts, mostly in the manner of use that no one ever intended. Almost from the beginning of the PC era, spreadsheets were seen as a way to prototype or even deploy a small application. It made sense too. The thousands of “applications” developed in spreadsheets from sales forecasting and compensation to list management use the row and column metaphor adequately. But virtually every spreadsheet eventually suffers from the same problem that hastens its demise. Spreadsheets have no database behind them and once a cell is changed, that’s it. There is no history to analyze. But by adding file management capabilities and by intelligently supplying a long list of template applications, Smartsheet manages to get past the common spreadsheet limitations and make itself very useful. 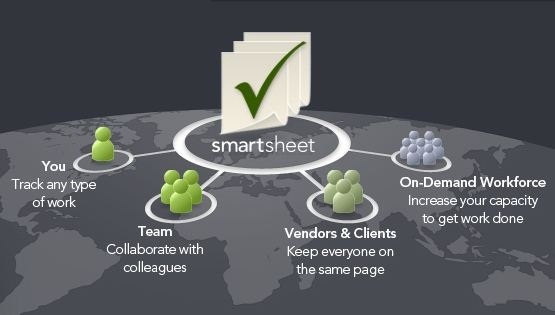 File management is what gives Smartsheet its collaboration capability. Within the tool users can develop project management solutions including Gantt charts, perform simple workflow and much more. Smartsheet is a SaaS tool and it integrates with Google Apps and some CRM. This is not a collaboration tool a la Chatter with its corporate stream of consciousness metaphor. But Chatter seeks to do some of the same things the Smartsheet does to assign work and develop workflow. The two look to be compatible, not conflicting. Smartsheet may be a good choice for any company still using spreadsheets to track and manage data and people in situations where they would never consider application development.